What links will we strengthen? Sometimes the links involve values more than anything else: reverence for the dignity of all humans underlies our efforts whether we are working to end CIA torture, improve education, raise the minimum wage, or end police racial profiling. Sometimes the links involve methods: Cannot street theater and other joyful protest help stop wars and foster racial understanding? Sometimes the links involve our philosophy of life, as we apply nonviolent words and methods to our daily interactions as well as to our global solutions. Sometimes the links are clear as we recognize that climate change will hurt the poor the most all over the world and rising oceans will affect coastal peoples of color most directly, from New Orleans to Pacific atolls. Sometimes it takes decades to see the environmental links of the poisons used in warfare, natural resource exploitation or the greed of corporate development and expansion. As we share the lovely space at Seabeck with its mountain and water views for the 3 days and nights we will be together, we will consider how we can work more effectively for the goals we have, individually and collectively: sharing the world’s resources more equitably, creating the inclusive beloved community, saving our beautiful blue and green planet. Let us teach and learn together how better to put our shared values and visions into realistic action. Ending the endless wars … working to share the world’s resources more equitably … creating the beloved community which includes all kinds of people … saving our beautiful blue and green planet from climate catastrophe. Educating ourselves, both teaching and learning about the links between these issues, and figuring out ways that individuals and organizations can better connect and effectively put our shared values and visions into realistic action. Three days and nights of work and fun, renewal and reinvigoration. Join over 200 activists of all ages at the 57th Annual Fellowship of Reconciliation Northwest Regional Conference in a beautiful setting on the Hood Canal. Talks, workshops, music, child & youth educational programs. We are pleased to announce that Jacqueline Patterson, Director of the NAACP Environmental and Climate Justice Program, and Rev. Osagyefo Sekou who has been working on the ground in St Louis since mid August on behalf of the Fellowship of Reconciliation will be our keynote speakers. our website http://www.wwfor.org will have full details in the coming months. Check back for information in the spring about 2015 conference! Join us for 3 days of learning and sharing, renewal and fun as we explore the power of nonviolence – how it can be used to harness our outrage at injustice and express our compassion toward all. 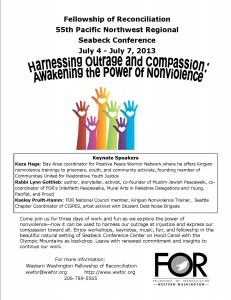 Enjoy workshops, keynotes, music, fun, and fellowship in the beautiful natural setting of the Seabeck Conference Center on Hood Canal with the Olympic Mountains as backdrop. The keynote speakers will be Kazu Haga, Rabbi Lynn Gottlieb, and Kaeley Pruitt-Hamm. We will also be joined by the coordinator of International FOR, Francesco Candelari. Chose from over 20 workshops on a broad range of peace and justice issues. Youth and children’s programs are offered. There will be outstanding music, a half dozen activities in the arts, and great meals, including the popular salmon bake. Leave with renewed commitment and insights to continue our work. This year we especially welcome members from around the country of the Religious Peace Fellowships affiliated with FOR. Our conference will be a national gathering for the Lutheran Peace Fellowship. The Religious Peace Fellowships (RPFs) will hold a panel on Friday morning. A dozen RPFs are organizing for peace with justice within most religious denominations – from Episcopal, Presbyterian, and Unitarian to Buddhist, Jewish, and Muslim. We’ll explore the wide-ranging contributions and insights of RPFs as well as the ways the FOR movement has supported and been strengthened by the RPFs and the ways those relationships can be even more powerful in the coming years both locally and nationally. The panel will consist of representatives from several RPFs. 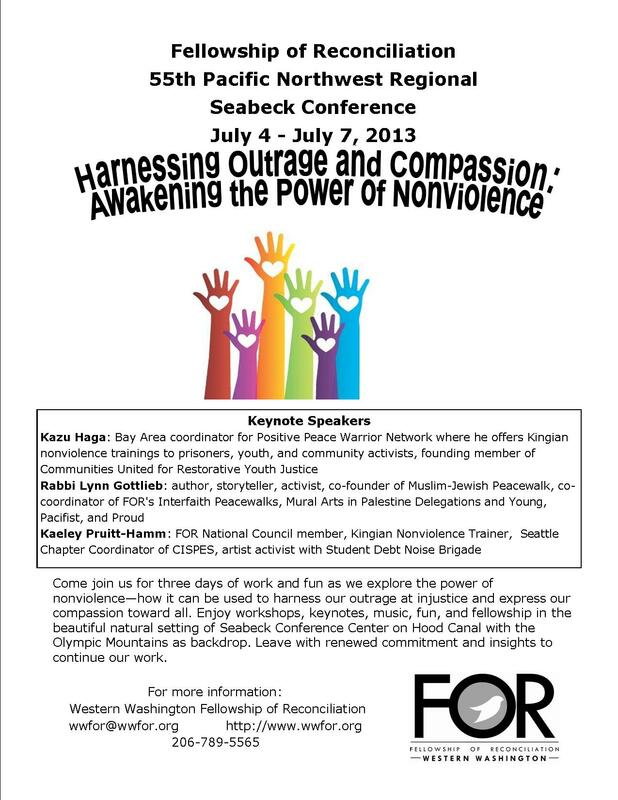 Online Registration for Seabeck 2013 is now available through our partner Oregon FOR. View complete instructions and online forms. Note that in order to defray the cost of paying your fees online, we have added a surcharge of $3 to all adult registration fees (youth and children are not charged). You may register online and choose to mail in your payment instead of paying online. Help us spread the word by downloading and posting the flyer in your local coffeehouse, church, or community center.